Search volume is only half of the keyword research equation. The other half is commercial intent. Keyword research is second nature to marketing and SEO professionals. It begins with looking for keywords that have good volume, or possibly long tail variations that are easier to rank for. The train shouldn’t stop there, though. Instead, businesses should be looking into the level of commercial intent behind each keyword. Unfortunately, commercial intent isn’t something you can assign a number or a percentage to. It’s a more generalized concept, but an important one nonetheless. It represents how far along a potential customer is on their journey to making a purchase decision. The level of intent modifies how you should target that specific keyword. Today I’ll show you how to measure this level of intent, and how you can use this knowledge to better target and utilize your most valuable keywords. When someone is beginning their search online, the first thing they are looking for is information. This brings us to our first type of search intent: Informational. Let’s say the customer is potentially interested in web hosting, but they don’t know what it is. 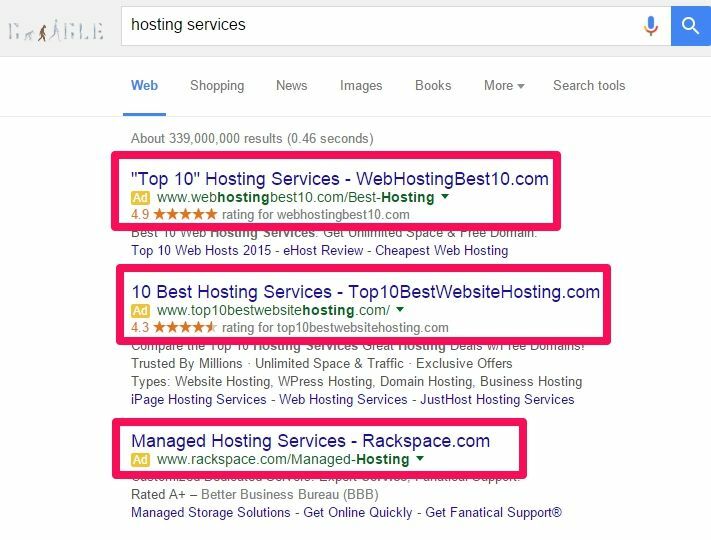 In this case, they’ll search something like “What is web hosting?” They’ll be looking purely for informative posts. They don’t want to be sold anything; not yet. At this point, they could be looking for information on how to start a blog or a website. Once they’ve found the information they need, then they will likely start searching with a commercial intent in mind. They’ll move on to something like “Best cheap web hosting,” which shows that they are now in the mindset that they want to purchase hosting, they’re just looking for the right provider. Here you’ll find product-specific keywords. These keywords have a moderate level of commercial intent, and represent high potential for conversions. These types of keywords show an intent to buy, and the customer is really just looking for who can offer them the best deal. Remember that the type of business you have will dictate how these keywords affect your specific audience’s commercial intent. If you offer a service, then something like “best” or “review” may be more valuable than “buy.” Offering a free sample or consultation of the service can also sweeten the pot in cases like these. Targeting the proper keywords with commercial intent will bring in leads that are lower in the purchase funnel than the traffic you would get from organic search rankings. It’s important to target a wide variety of keywords, but those with purchase intent are your best bet for conversions and ROI. Now that we’ve covered the concept of commercial intent, and how it shows where the buyer’s mindset is at, we need to know how to find these keywords and rank for them in a way that puts your product or service in front of the right people. Out of those, we could pick out “WordPress hosting” or “hosting services.” Both of these have a level of commercial intent that we can follow deeper into the funnel. 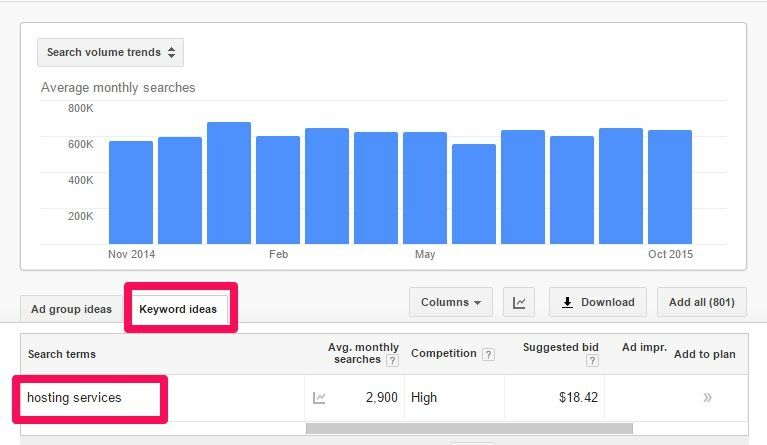 While Google’s Keyword Planner has long been a great tool for finding new keywords, it can also be used to seek out the kind we’re looking for. Head on over to the site and sign in. Once you’ve done that, select the first option on the next page. For this example, I entered “Hosting Services” into the search box. Once you’ve identified your top keywords with high commercial intent, you need to start using them. There are two ways to do this: organic search and PPC (pay-per-click) campaigns. Let’s start with organic search. 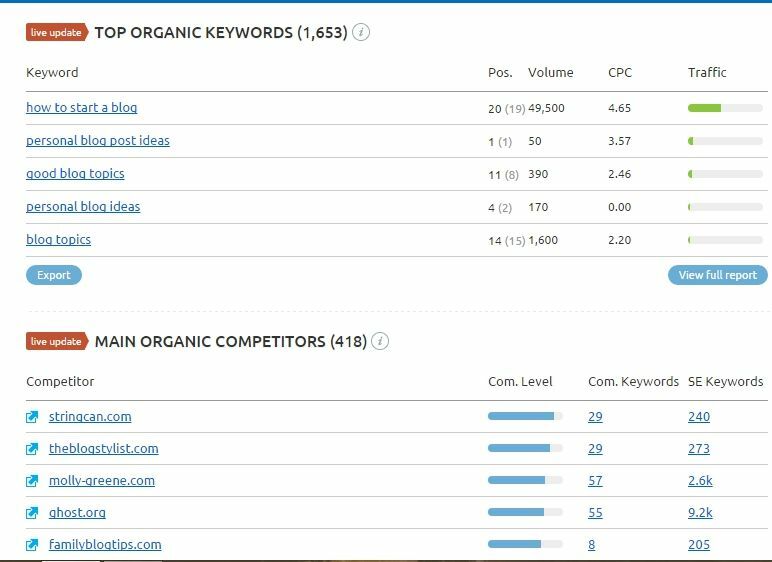 Using a tool like SEMrush, we can analyze both your business and your competitors to see which keywords you’re ranking for and which pages are receiving the most traffic. Using this example, we can see which keywords you’re ranking for. It also provides a list of your top competitors. Viewing these other sites and analyzing them can give you inspiration for your own. The Top Organic Keywords section allows you to see if you’re ranking for any keywords with commercial intent. 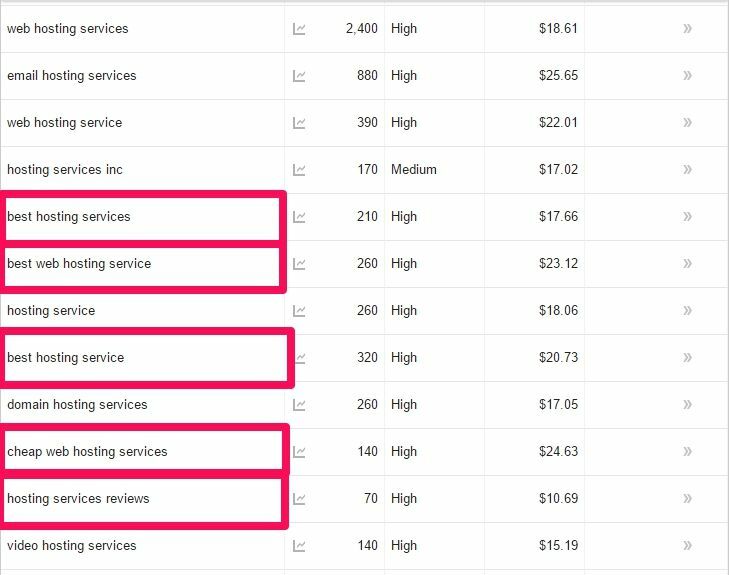 Taking these keywords/pages to your metrics and seeing which ones are converting will also provide you with an idea of which keywords are working in your favor. This is an ongoing pursuit. The potentially more profitable method is using PPC campaigns. These can be incredible for driving your sales and conversions, but they are only successful when the right keywords with high commercial intent are used. When you create one of these campaigns, you choose keywords to target and pay a certain fee each time they are clicked. Depending on the keyword being searched and the bid you choose, your ad can appear like these above the search results. Unlike organic search, these types of ads can be controlled based on your goals and budget. Ultimately, the most successful Google AdWords campaigns and the highest conversion rates come from finding and targeting keywords with high commercial intent. These will almost always bring you traffic and leads that are near the bottom of the sales funnel and looking to buy. Search volume is only half of the keyword research equation. The other half is commercial intent. If you want higher conversions and better traffic and leads, you need to seek out the keywords that show an intent to buy and rank for them both organically and in PPC campaigns. How do you find and utilize keywords with commercial intent? Share your tips and thoughts in the comments below!